A clear thrust on quality control and R&D. As a well stated policy of satisfying the global customers, RONSON never compromises on quality. A well equipped laboratory serves as the purpose of checking all the quality parmeters as well as in-house Research & Development activities. The usual equipments such as Roll-mills, Vibro-shaker, Muller, Auto Applicator, Spectrophotometer and many more are there and we are in the process of acquiring more, with conscious effort to improve the quality management system. People love colours. But for that, all qualitative parmeters have to be perfectly in place, in to the product they use as the customers, whether it’s a piece of textile, a plastic item, a rubber-toy, a coating of paint…. whatever. 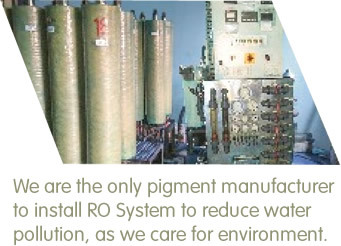 Technicality of the perfect pigment is our responsibility. Quality is a continous quest, here at RONSON. We keep updating our knowledge and production methos, keep in touch with market trends, keep trying newer equations and applications for a break through. All of us are real quality control freaks! We think every single pack has to satisfy the user, small or big. So each and every batch is tested and approved before being packed. 2019 RONSON GROUP. All Rights Reserved.